The quality of its management faculty, its case-study based approach to learning, that it can get Lalu Prasad Yadav as a guest lecturer… take your pick on what makes IIM-A the king of the B-school hill. It’s still early days for Soumik Sardar (27) and Deepak Varma (24) at the campus of the Indian Institute of Management Ahmedabad (IIM-A). Barely a fortnight after arriving at the picturesque campus, the two engineers spend most of their free time reveling in the fact that they have made it to the best B-school in the country. They’re still exploring the campus and catching the occasional game of football. “Just looking at the campus is an experience,” says Sardar, who is still soaking in the stunning architectural work of Louis Kahn. However, both Varma and Sardar know that it’s just a matter of time before academics will consume their sightseeing and ambling walks. “The A in IIM-A stands for acads,” says Sardar, with a wry smile. “Several seniors have asked us to enjoy as much as we can right now. And they don’t do that just to psyche us out…I can see genuine concern in their eyes. It’s all a bit scary,” adds Varma. Varma and Sardar have reason enough to be scared. For one, IIM-A’s post-graduate programme (PGP) is amongst the most rigorous management PGPs in the world, with over 1,000 hours of contact between faculty and students. But the magic potion of the country’s best B-school has more ingredients than just long hours for its students. 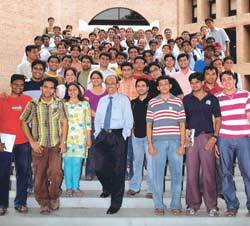 That IIM-A has the largest repertoire of management case studies in the country (over 3,000), it notches ahead of its competitors in terms of student placements, provides probably the best environment for pursuing education, and has the most distinguished old boys’ network is all well-chronicled and acknowledged. But another factor that sets IIM-A apart from the rest of the country’s B-schools is its faculty. Most of its 87 teachers are Ph.Ds. In fact, a doctorate is almost a pre-requisite for becoming a faculty at the institute. Also, how many other institutes manage to get guest lectures from the likes of Vijay Kelkar, Sitaram Yechuri, Lalu Prasad Yadav? The buzz around campus is that former President A.P.J. Abdul Kalam is expected to handle a part of a course in the near future. It is, therefore, not surprising that the mushrooming of quality B-schools like the Hyderabad-based Indian School of Business has not impacted in any major way IIM-A’s standing as the premier school in the country or its ability to attract the top employers in the country and internationally. “An employer gets a whole range of offerings—from bright young freshers to seasoned professionals with several years of experience at the institute. Not many other institutes offer that,” says Saral Mukherjee, Chairperson, Placement, IIM-A. The fact that IIM-A constantly reviews and upgrades its courses on a regular basis helps it stay ahead of the curve in management education. In fact, very recently, the flagship course of the institute, the PGP, was reviewed and a whole host of changes are likely to be implemented during the current academic year. These range from simple changes like renaming drab titles of individual modules (for instance QM-1 & 2 are now called Probability and Statistics and Decision Making) to introducing compulsory courses on topics like ethics to updating content of modules. “As faculty, when we come back to teach courses we taught five years ago, we are often stunned at the amount of change that has happened,” says Jayanth R. Varma, Dean, IIM-A, who has been associated with the institute for over two decades. The institute has also successfully launched new courses like PGP(X), its one-year, fulltime residential programme for experienced professionals. In its third year now, the course attracted close to 1,400 applications for its 2008-09 batch, with an average GMAT score of 728, a score that’s likely to attract interview calls from the best B-schools globally. Having said that, it’s not as if the road ahead for the institute is paved with roses. The shortage of quality management faculty is particularly sharply felt by the institute, as a result of the mediocre government-controlled pay-scales. With private B-schools offering better pay and corporate houses perennially scouting around for senior talent, IIM-A’s faculty has become ripe pickings. “The number of senior jobs in corporate India with Rs 1 crore packages is rising. A fulltime professor, on the other hand, makes about Rs 6 lakh per annum,” emphasises Varma, highlighting the stark nature of the problem. The institute is attempting to tackle the problem on two fronts. One, it allows its teachers to take two years of unpaid leave and work for a company, thereby leaving the option open of coming back to the institute. Two, faculty members are permitted 52 days of consulting annually. But Varma concedes that these measures are stop-gap arrangements that are really being stretched as salaries outside the campus are on the rise. “These measures work better as a retention measure rather than as recruitment tools. How do I convince a Ph.D to come aboard simply on the assurance that he will be allowed 52 days of consulting? It may or may not work… band-aids don’t work beyond a point,” says Varma. If more than half of IIM-A’s faculty has stuck with it for more than a decade, it is proof of the culture of freedom that the institute has managed to create. The crux of the problem is financial and operational autonomy. As the institute is facing increasing competition not just nationally but also internationally (from Chinese Bschools that are dishing out sizable pay packets), it finds its hands are tied when it comes to deciding its own future. Late last year, the institute studied the cost of its flagship programme and discovered that it was very heavily subsidised. “We found that the cost of processing a student was subsidised up to 60 per cent. In other words, we are recovering just 40 per cent of the cost. The extent of subsidy ought not to be this high,” says Samir K. Barua, Director, IIM-A. The institute, therefore, hiked its fee early this year, only to draw flak from several quarters, including a parliamentary committee. The extent of subsidy on the PGP course, despite the hike, is close to 25 per cent. The average salary of a student completing a PGP course is close to Rs 18 lakh per annum.With the Supreme Court upholding the implementation of the OBC quota at IIMs, the challenges for the institute have multiplied manifold. “The student population at the campus is expected to increase by over 50 per cent from a little over 750 at present to close to 1,100 in two years. That translates into an ideal faculty strength of 120,” says Barua. Moreover, the institute has to build everything from classrooms to dormitories to accommodate the students. The government has promised Rs 38 crore to meet the expansion demands, even though the institute estimates that about Rs 54 crore will be needed. Even though IIM-A is streets ahead of its domestic competitors, its future prospects as a leading international B-school and its ability to hold on to its pole position domestically will be severely tested if some of its problems outlined here are not addressed in right earnest.